Julian Barnes is tonight (Tuesday 18 October) named the winner of this year’s £50,000 Man Booker Prize for Fiction for The Sense of an Ending, published by Jonathan Cape. Dame Stella Rimington, Chair of the 2011 judges, made the announcement at the awards dinner at London’s Guildhall, broadcast by the BBC. Jon Aisbitt, Chairman of Man, presented Julian Barnes with a cheque for £50,000. The judging panel for the 2011 Man Booker Prize for Fiction was: Dame Stella Rimington (Chair), author and former Director-General M15; writer and journalist, Matthew d’Ancona; author, Susan Hill; author and politician, Chris Mullin and Head of Books at the Daily Telegraph, Gaby Wood. 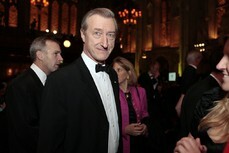 Julian Barnes is the author of ten previous novels, three books of short stories and three collections of journalism. Now 65, his work has been translated into more than thirty languages. In France he is the only writer to have won both the Prix Médicis (for Flaubert’s Parrot) and the Prix Femina (for Talking it Over). He was awarded the Austrian State Prize for European Literature in 2004 and the David Cohen Prize for Literature in 2011 for his lifetime achievement in literature. Julian Barnes has been shortlisted for the Man Booker Prize three times previously, for Arthur and George (2005), England, England (1998) and Flaubert’s Parrot (1984). He lives in London.